The Mammal displays in the museum depict a magnificent selection of over 400 specimen s including most of the larger southern African mammals and many smaller species too. Most were collected on expeditions by Captain Guy Shortridge, director of the museum from 1920 - 1949, One visitor described the display as "The Kruger Park in still-life", when he was able to see all the species he had recently seen from afar in said park really close up in the museum. The two elephants on display were collected in the Addo area (now Addo Elephant Park) near Port Elizabeth. 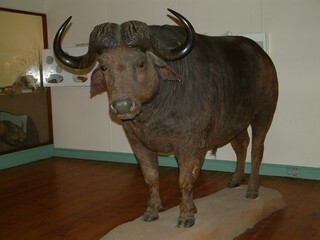 THE CAPE BUFFALO (Bos caffer) was formerly found throughout the whole of South Africa, but the combined assaults of its only two enemies, the lion and man, have in some districts so reduced its members that according to Drummond writing as far back as 1875, where there were formerly herds from ten to one hundred in numbers, now not ten are to be found. Although Buffaloes are reckoned the most dangerous of South African animals, few instances occur of them charging without provocation, and the number of lives lost in buffalo hunting is probably due to want of care in approaching wounded animals. When charging, a Buffalo does not lower his head but raises his nose in the air, and just before reaching his object, suddenly twists its head round sideways and impales his foe. The specimen on exhibition was shot near Trappe's Valley in the Bathurst district of the Eastern Cape in 1906 and Mr Pym (the first director of the Amathole Museum) gave the following account of how it was secured.